Biddeford does not offer what one expects from a coastal inlet town in Maine. The lobster shacks, lobster-related sundries, and quaint shops are all absent. But Biddeford offers soul. At 18 miles south of Portland (a foodie’s heaven) and 12 miles north of Kennebunkport (a vacationer’s heaven), Biddeford isn’t afraid to be a different kind of paradise: a place for stalwarts, historians, kids, immigrants and city-lovers. Amtrak’s Downeaster train makes the two hour trip from Boston to Biddeford several times daily. The passengers are polite, the cafe car is stocked, and wifi is free. You can walk from the station to downtown Biddeford in about ten minutes. In less time that that you can stop for a hot bowl of pho at Que Huong, the Vietnamese restaurant on your way into town. Opposite Que Huong, a fortress-like brick wall lines this opening length of Main Street. 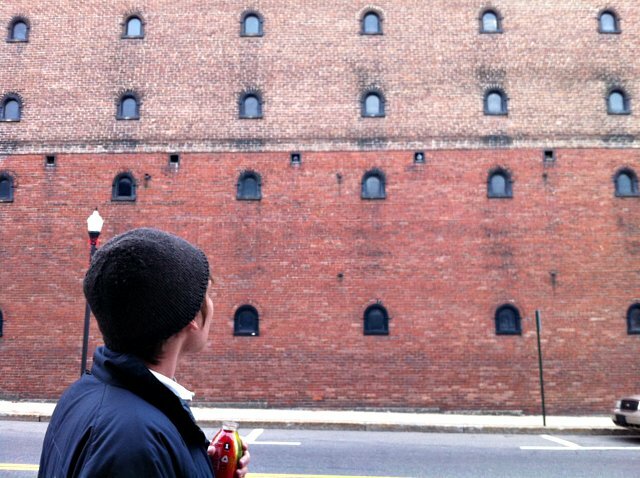 Behind the wall, the sturdy remains of a 19th century factory stands ready to be repurposed. The Pepperell Mill Campus alone is 1.1 million square feet of gorgeous maple floors in 17 buildings on 18 acres of land looking out to the Atlantic Ocean. 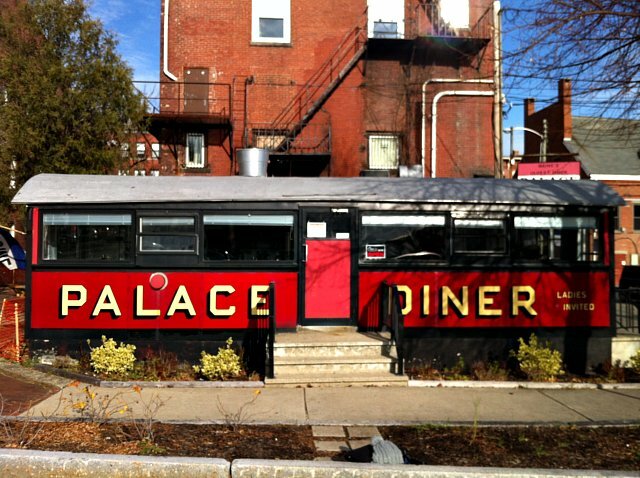 If you walk down Main Street, take a left into Shevenell Park (which looks like nothing but actually hosts local musicians and their fans on summer evenings) and then take another left, you’ll find yourself in front of the Palace Diner. You’ll feel like you’ve really dug up a gem when you sit down at the Palace. 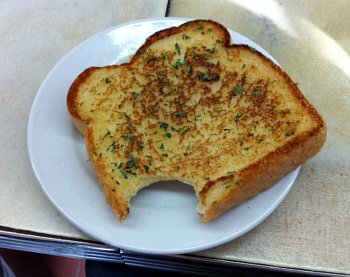 At John’s urging we tried the garlic toast, which is good enough to be classic American comfort food. Keep up with them on Twitter, @palacediner. The Saco river that once powered the hulking mill buildings at the heart of downtown is already a popular place for kayaking and fishing. In August the city began building the first phase of a river walk that will provide scenic views of the river and a walkable crossing to Saco, Biddeford’s twin city. 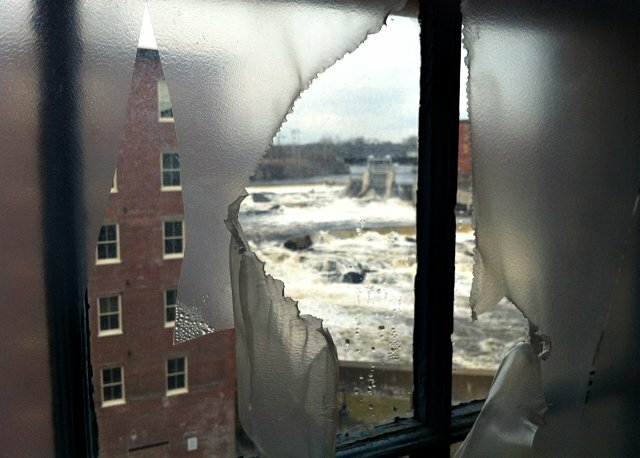 A visit to the North Dam Mill, the first in a series of renovations by developer Doug Sanford, provides a close up view of these industrial giants and how they are being brought back to life. The mill’s upper floors are devoted to residential spaces; hardwood floors, exposed beams and other details mean no two units are alike. Perk, Union House Pub and Pizza, and the Biddeford Mills Museum are among the first floor occupants. The Museum offers historical tours, taking visitors deep inside the undeveloped areas of the buildings. Before it was a library, it was a church. Behind the balcony that once looked out on the pulpit, a locked storage room holds a cache of yet unsorted Biddeford valuables: documents, photos, old magazines, and even the rifles from the Biddeford Horse Cavalry from the 1850s. 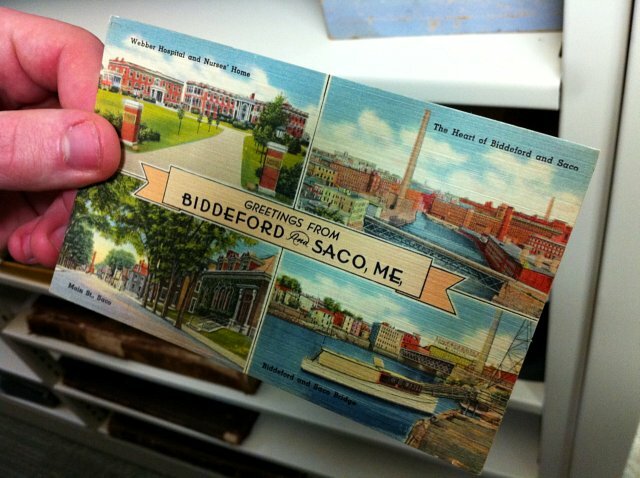 Although this room isn’t on Biddeford’s annual Secret Spaces, Historic Places tour, its very existence is in keeping with Biddeford’s ability to see the future in its past. The church became a library in 1902, and the land under it came to host a church in 1863, a few years after the parishioners of Pavilion Congregational Church split over the question of whether to bring Jefferson Davis, provisional President of the Confederacy, to speak to them. Those who supported Davis’ right to speak founded their own church, the Second Pavilion Congregational Church. The MacArthur Library maintains that spirit of independence and community service. A local board, whose members are committed to their library, guide its budget and programs. The library relies on donations and trusts put in place over 100 years ago, freeing it from the fluctuations that can come with city funding. A few years ago, Greg and Kristin Jaime moved from Brooklyn to Biddeford where they took over a music venue on Main Street and named it The Oak + The Ax. The warm and inviting interior looks like it could be your grandmother’s living room — if she squeezed in a bar and sound system. Couches and candle-lit tables fill the space in front of a small stage illuminated by the rosy halo of vintage lamps. At the bar visitors can sample an array of Greg and Kristin’s homemade delicacies, includingspiced wine and apple cider during the coldest months. Greg heads an alternative folk band based in Brooklyn called O’Death and makes full use of his connections in the music scene to attract a wide range of notable artists to Biddeford. Performers have come from all over the United States, but often share the stage with local acts. The Oak and The Axe features poetry, films and art openings too. A recent concert featured Nat Baldwin of the Dirty Projectors, Kurt Weisman, a multi-talented musician and poet from Vermont, and Phantom Buffalo, a local rock band from Portland. Nick Kaufmann and Alexa Mills wrote this article after spending the day in Biddeford, Maine, which is Nick’s hometown. What would you include in a tour of your home turf ?